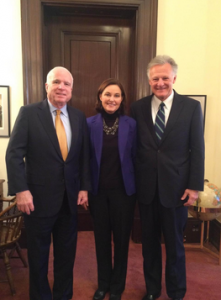 Washington D.C. (November 18, 2014) – Today, Senator John McCain (R-Ariz.) met with with Susan and Richard Selke, parents of Iraq and Afghanistan war veteran Clay Hunt, a Marine who died by suicide in 2011. Yesterday, Senators McCain, Richard Blumenthal (D-Conn.), Richard Burr (R-N.C.), Roy Blunt (R-Mo. ), Lisa Murkowski (R-Ala.) and Joe Manchin (D-W.Va.) introduced in the Senate the Clay Hunt Suicide Prevention Bill of 2014 (S.2930), named after their son and spearheaded by IAVA. If passed, the bill will help combat veteran suicide and improve access to quality mental health care. Susan Selke will be testifying Wednesday morning at the Senate Veterans Affairs Committee (SVAC) hearing on Mental Health and Suicide Among Veterans at 10:30 a.m. in Russell Senate Office Building SR-418. To learn more about the Clay Hunt Suicide Prevention Bill of 2014, visit iava.org/savact.